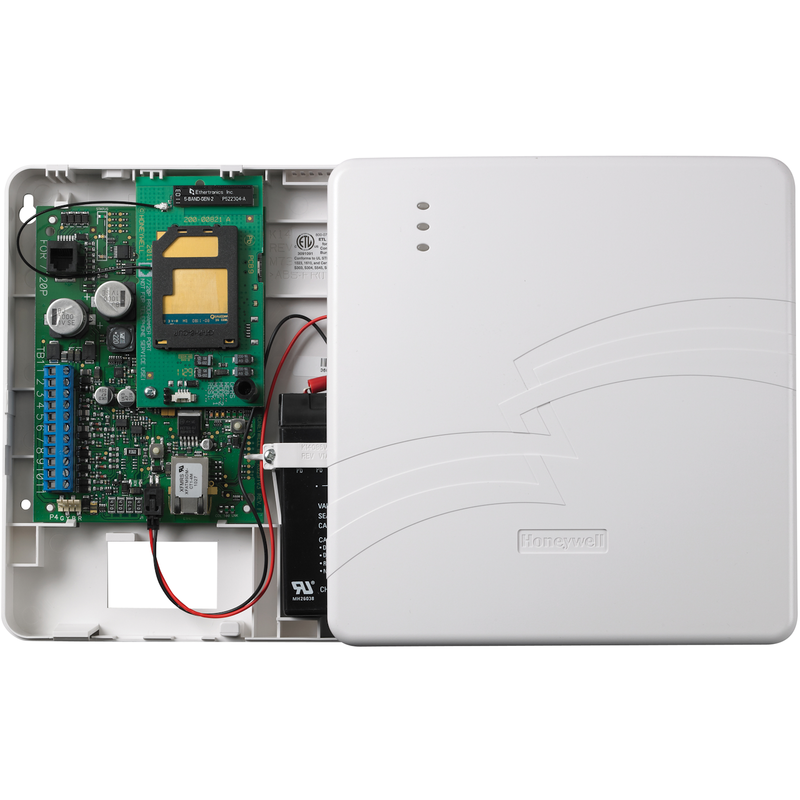 The Honeywell iGSMV4G-TC2 is dual-path (internet and GSM cellular) communicator with a Total Connect 2.0 chip for interactive alarm monitoring services. The Honeywell Total Connect 2.0 upgrade kits are intended to allow upgrading of existing VISTA-15P/20P (FA148CP/FA168CPS) and Vista-15PSIA/20PSIA installations to Total Connect 2.0, the next generation of remote services. Each kit includes an ECP Communicator and firmware chips for VISTA-15P/20P (FA148CP/FA168CPS) and Vista-15PSIA/20PSIA control panels. Honeywell is focused on providing the best alarm communication solutions for the security industry. Alternative communication methods are critical in the marketplace due to VoIP, migration from POTS and global growth of digital networks. The Honeywell iGSMV4G-TC2 is a AlarmNet dual-path alarm communicator with Total Connect 2.0 capabilities. As well, the iGSMV4G-TC2 has full data reporting and uploading/downloading for most Honeywell control panels. In addition, with onboard zone inputs and optional dialer capture capability, we're compatible with other manufacturers' security panels as well. Honeywell communication products and control panels combine to make installations faster and easier. All signals are delivered to Honeywell's AlarmNet® Network Control Center, which routes the information to the AlarmClub central station. The state-of-the-art AlarmNet Network Control Center is fully redundant and monitored 24/7. AlarmNet has the ability to route messages using AlarmNet-i and 800 PLUS services, providing true redundancy and multi-path message delivery. •Multi-GSM platform compability: 2G, 3G and 4G. •Full Contact ID or ADEMCO® High-Speed Reporting: Contact ID reporting using ECP mode with compatible Honeywell control panels or combined with optional dialer capture for non-ECP capable control panels..
•256-bit AES Encryption: Advanced encryption standard used for secure communications. •Upload/Download: Available with select Honeywell control panels. Requires Compass version 1.5.8.54a or higher. Quick and easy installation of cellular communicator for VISTA™ and LYNX controls. •Dynamic Signaling with Certain Honeywell Control Panels Provides management of control panel dialer and digital cellular communicator. Programmable priority and delays determine signal path. •Diagnostic LEDs Provide signal strength and status indications. •QOS Quality of Service diagnostics via AlarmNet supply vital information including when a message was received, battery voltage, input voltage, signal strength and message path. •Web-Based Programming Allows complete interactive programming from AlarmNet Direct. •Intelligent Supervision Any message generated serves as a supervision message per optional 24 hour or 30 day intervals. This feature effectively limits required messages to be sent. •Remote Services Capability* Optional Honeywell Total Connect® 2.0 Remote Services value-added web-based or SMS system control as well as e-mail notification of system events. Not available with iGSMHS4G. •Two-way Voice Transport GSM voice channel capable to allow two-way voice session in conjunction with an audio verification system (U.S. and Canada only). •Line Security Approved for line security applications with 200-second supervision intervals (iGSMHS4G).